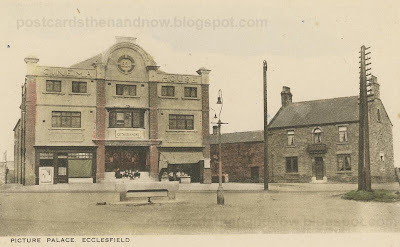 Ecclesfield, Yorkshire, The Picture Palace c1920. Ecclesfield is a town to the north of Sheffield. This cinema is a classic example of an early 'fleapit' cinema. The date on the top of the building proudly proclaims 1920. When this photograph was taken the cinema was showing a film called 'Get Thee Behind Me' (1918). If we look at the Street View image for this scene we see that the building on the right, previously the Earl of Arundel pub, is now an Indian restaurant. Alas, the magnificent cinema has been reduced to a car park. I'm glad you mentioned that Get Thee Behind Me was a film. I looked at the picture before I read the text, and I was ready to assume that the building did double duty as a cinema and worship space. Believe me, it wasn't always a 'Flea Pit' cinema. At one time it was immaculate inside, with palm trees either side of the stage. It was the last owners who let it go to rack and ruin.